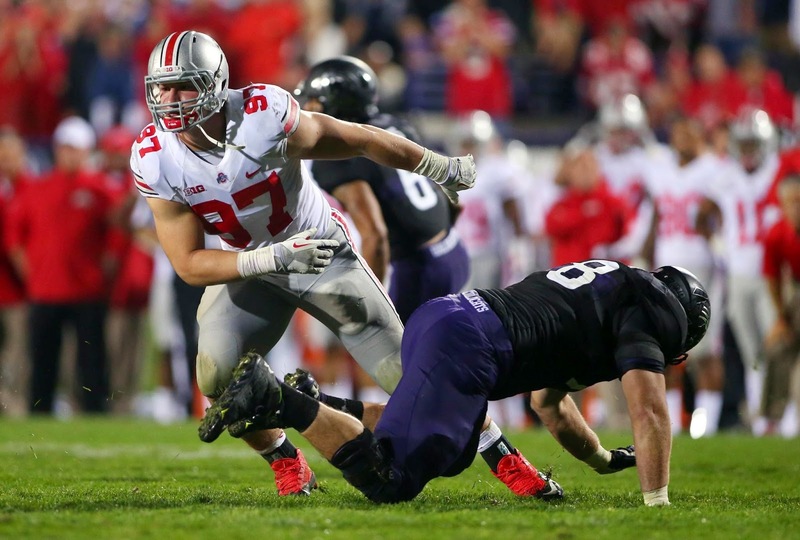 Sophomore defensive end Joey Bosa may be the most complete member of Ohio State's potentially dominant front-7. The Big Ten may have actually played the biggest football game in its history in the last decade, though it seems like an eternity ago now. But since then-No. 1 Ohio State topped then-No. 2 Michigan 42-39 in 2006's "Game of the Century" the conference has gone just 5-10 in BCS Bowl games, including two losses to SEC teams in the title game. While The Big Ten fancies itself a football power, the results simply haven't been there. In fact, it would be fairer to compare The Big Ten to the Mountain West and now-defunct WAC, who went a combined 4-1 in BCS bowl games over the same span, than to the SEC, who won more national championships (7) than The Big Ten did BCS bowl games (5). What the conference has done well, however, is brand itself and make money hand over fist. With The Big Ten Network thriving and delivering $44.5 million a year to senior conference members (schools in The Big Ten for six years or more. Sorry Rutgers and Maryland, wait your turn!) beginning in 2017, every football team will have the resources to contend. The conference should again be powered by Ohio State, Michigan State and Wisconsin, while Michigan, Penn State and Nebraska try to live up to their rich traditions of winning. Northwestern seems ripe for a rebound after a disappointing 2013, and Iowa looks like Iowa again (boring but effective). Indiana has an offense that can score on anybody, but will the Hoosiers be able to, as Bart Scott once said, "stop a nose bleed?" Minnesota was better than you remember last year, but can they surprise again? Finally, how will newcomers Maryland and Rutgers affect the conference race? As for my alma mater, Purdue… Don't ask. There may not be much elite football going on here, but there are enough great stories and big names. that The Big Ten will once again be must-see TV. The normal prerequisites for a conference favorite include a large number of returning starters and a team that finished the previous season on a high note. Ohio State has neither of those things. The Buckeyes lose half their starters, including first round picks Ryan Shazier, a speedy outside linebacker, and Bradley Roby, an all-around corner. What Ohio State does have is the most dynamic talent in the league in the form of quarterback Braxton Miller, and a coach that flat-out knows how to win in Urban Meyer. Oh yeah, and the Buckeyes may have the best front-7 in the country, even without Shazier. Ohio State will look for Miller to be even better after a season that saw him accumulate over 3,000 total yards and 36 touchdowns with only seven turnovers. If rumors out of Buckeye camp are to be believed, Miller has progressed as a passer, and should be ever more lethal with receiver Devin Smith and security blanket tight end Jeff Huerman both back for their senior seasons. On defense Ohio State is built strong up front, with perhaps the best pair of defensive ends in the country. Junior Noah Spence and sophomore Joey Bosa combined for 15.5 sacks and 28 TFL last year, and both were in their first seasons starting. With another year of experience, look for that pair, along with tackles Michael Bennett and Adolphus Washington, to from the best defensive line in The Big Ten, if not the nation. Only Shazier leaves the linebacker corps, where star weakside backer Josh Perry returns for his junior season. Senior Curtis Grant will again be a stabilizing force in the middle, and uber-talented sophomore Darron Lee is expected to fill in capably on the strongside. For as talented as the secondary was with Roby and safety C.J. Barnett, the OSU pass defense was actually a disappointment in 2013, ranking second-to-last in the conference in yards per game allowed. This year's group returns senior corner Doran Grant, who was every bit as productive as Roby last year, with a pair of speedy sophomore safeties, Von Bell and Tyvis Powell, expected to fill in as starters. Rarely can you say a group that lost three starters, including a first round pick, should improve, but it's hard to see this group being any worse than last year's unit. If Ohio State gets the expected improvement from Miller, the supporting cast around him and the fabulous front-7 on defense is good enough to contend for The College Football Playoff. The Spartans won several memorable close games, including The Big Ten Championship Game vs Ohio State, on their way to a conference crown and Rose Bowl win last season. Those games made heroes out of then-sophomore quarterback Connor Cook and then-junior receiver Tony Lippett. Both of those guys will be back, and what was a caretaker offense should be the most potent Spartan attack in recent memory. Look for Cook to go from game manager to legitimate All-Conference contender, and Lippett's big body and excellent hands to make him one of the most feared receivers in the conference. Jeremy Lanford returns after eight straight 100-yard rushing performances to end last season, and 1,422 yards on 5 YPC. The Michigan State offense should be much improved, but their chances of a repeat depend on their largely rebuilt defense. Last year's MSU defense may just have been the best in the country, but with stud corner Darqueze Dennard and longtime starters Max Bullough and Denicos Allen all gone to the NFL, only five starters returns for the Spartans. The good news is there are play makers to be found. Defensive end Shilique Calhoun returns after a 7.5 sack 14 TFL junior year, and most folks in Big Ten circles seem to think he could be the league's best pass rusher on 2014. Senior safety Kurtis Drummond is a rangy and instinctive piece to rebuild the secondary around, and junior corner Taiwan Jones has the speed to fill Dennard's shoes. There are pockets of experience, but a lot more raw talent on defense. If coach Mark Dantonio is to again win The Big Ten, he'll need to live up to his reputation as a player developer and defensive guru, getting this unit to gel quickly and take advantage of the rare offense currently residing in East Lansing. The Buckeyes have more top-end talent, but MSU could end up, once again, being the deepest and most complete team in the conference. After a disappointing 7-6 season in Ann Arbor, Wolverine fans feel there is nowhere to go but up. Well, as a rush offense, they aren't wrong. Last year's Michigan running game was arguably the worst in the last half-century for the program, rushing for only 3.3 YPC (2.5 in conference play! ), leading the Wolverines to start nine different linemen. Nothing worked, so expect new offensive coordinator Doug Nussmeier to burn things down and simplify everything to inside and outside zone concepts. Quarterback Devin Gardner is back for another year starting, but he'll need to improve his completion percentage and cut down on overthrows, or former five-star recruit and current sophomore Shane Morris could be starting by season's end. Tight end/receiver Devin Funchness may be the team's best weapon on the outside, and will certainly lead to many mismatches the Wolverines can exploit. The news is much better on defense, where a pair of linebackers enter their fourth seasons as starters. All American candidates Jake Ryan and Desmond Morgan, along with returning starter James Ross, could give UM the best linebacking group in the conference. If the offense can simply be average and not turn the ball over, this defense should be good enough to keep Michigan in games with anybody, even the aforementioned powers above them. Coach James Franklin left the Vanderbilt program that he had pretty much built from scratch so that he could contend for titles in Happy Valley. The Nittany Lions may not quite have the depth to return to prominence this year, but they certainly have some talented young pieces to be competitive. Sophomore quarterback Christian Hackenberg may be the most talented underclassman signal caller in the country, and seems poised to break out after throwing for nearly 3,000 yards on 59 percent passing with a 20/10 TD to INT ratio as a true freshman. Hackenberg was named The Big Ten's Freshman of the Year in 2013. With Allen Robinson gone to the NFL, look for a youth movement at receiver, where talented sophomore Geno Lewis looks for a bigger role, and freshman De'Andre Thompkins could make a big impact right away. Zach Zwinak is back for another year at running back, but questions abound along the offensive line, where years of scholarship restrictions have left PSU without enough scholarship players to even fill out the top-8 spots on the line. Penn State will have a ton of experience returning in its back seven, as all four members of the secondary will have starting experience, and two of three linebackers started last season, led by senior Mike Hull. Again, the trouble will be in the trenches, where Penn State returns end C.J. Olaniyan (5 sacks in 2013) and Deion Barnes (2012 Big Ten Fr. of The Year). Barnes will need to regain his 2012 form after a sophomore slump if he and Olaniyan hope to carry a thin and inexperienced line to respectability. Like many teams in the middle of the pack, Penn State lacks depth and experience, but if its young top end stars break out, the Nittany Lions could end up in a major bowl. You keep getting the feeling that Indiana is about to break out under offensive guru coach Kevin Wilson, but three years in and the Hoosiers still have to play in a bowl game. To Wilson's credit, IU's recruiting has picked up immensely, the win total has risen each year (from one in 2011, to four in 2012, to five last season) and the Hoosiers feature one of the most exciting offenses in the country. Only Ohio State topped Indiana in total offense last year in The Big Ten. But it just seems like every time things are lined up perfectly, something goes awry. Last season a disappointing loss to Navy and Missouri being far better than anyone anticipated practically sank IU's bowl hopes before the conference slate even began. A big win over Penn State gave the faithful hope to start The Big Ten season, but another close loss, this time to Minnesota, ultimately kept the Hoosiers home for the holidays for a sixth straight season. This year the two-quarterback system that worked surprisingly well loses its explosive element with the transfer of scrambling quarterback Tre Roberson. Nate Sudfield is an accomplished passer, but Roberson's package work lessened his burden, and the loss of both leading receivers could cause some growing pains as well. The defense returns nine starters and has pretty much nowhere to go but up. Of course, we seem to say that every year with the Hoosiers and the defense still lags behind the majority of the conference. The closest thing IU has to a pass rusher is OLB David Cooper, who returns also as the team's leading tackler. Indiana has ranked dead last in the conference in each of Wilson's three seasons, but last year was a different level of ineptitude, as the Hoosiers allowed 530 yards and 39 points per game, over three points and 70 yards worse than 2012's last place defense. New defensive coordinator Brian Knorr will attempt to right the ship, and Indiana's bowl hopes hinge on him figuring something out. The Terrapins will need to get things sorted out with their receivers, as star Stefon Diggs is coming off a broken legs and expected starter Nigel King just transferred away to Kansas. Still, there is plenty of talent on the outside, but it will be on up-and-down quarterback C.J. Brown to take advantage of it. The offense also returns its top eight rushers and three starting linemen, but the health of Diggs (who plays in the slot and backfield) will largely determine what the Terps are able to do in their first season in The Big Ten. The defense is loaded with experience, as nine starters and four other regular contributors return from a group that posted respectable numbers in the ACC. Senior end Andre Monroe enjoyed a big 2013, piling up 9.5 sacks and 17 TFL, but keep in mind that the Terps will be preparing for an almost entirely new set of opponents and schemes this year, while the rest of the conference has a certain level of familiarity with most teams they'll face, That, combined with the questionable healthy of Diggs and inconsistent play of Brown has me hesitant to expect too much from Maryland in Big Ten year one. Like the Terps, Rutgers will have to deal with an entirely new slate of opponents, and unlike the Terps, it will also be a major step up in competition. Other than UCF and Louisville, the American wasn't exactly a great conference last year, and Rutgers went only 3-5 in the former Big East. Though nine starters return on offense, including quarterback Gary Nova, the Scarlett Knights are simply too turnover prone and inconsistent for that to inspire much optimism. Tight end Tyler Kroft is a stud, and could immediately be one of The Big Ten's best at his positions, but no big play receivers or backs have emerged for Rutgers since last season ended. The defense is loaded with experience as well, and the return of linebackers Steve Longa and Kevin Snyder should give hope that things can improve. A pass rusher will have to emerge, and a defense that was good against the run (allowed only 3.1 YPC), will need to improve dramatically against the pass (surrendered over 310 YPG in lesser league). Three starters returning in the secondary could be good news… Or very, very bad news. We'll see. Wisconsin has quietly become one of the premier programs in The Big Ten, and is certainly the most consistent team over the last decade. The Badgers have done it with exceptional line play (they return four starting big uglies up front), downhill running from backs (Melvin Gordon returns after rushing for over 1,600 yards on nearly 8 YPC), and forgiving schedules (Wisconsin gets Rutgers and Maryland out of the East instead of, say, Ohio State and Michigan State). So all three check marks seem to be there for another Badger divisional title. Still, the best Wisconsin teams have also had solid quarterback play, so junior Joel Stave will have to cut down on the 13 interceptions he threw last season. Wisconsin will also need to rebuild its defense, replacing longtime leaders like linebacker Chris Borland. In fact, all four linebackers must be replaced from last year's squad. The return of stud safety Michael Caputo should help, and the Badgers always seem to be able to plug new guys in and maintain a high level of play. Ultimately, this may not be a great Wisconsin team, but it should be good enough to capture a weak West division. Case in point for the general weakness of this side of the conference: Northwestern is a dark horse contender after missing out on bowl season in 2013. But, there is a lot to like about the Wildcats. Northwestern returns the most starters in The Big Ten with 17 (9 Off. 8 Def. ), and all but one sack from their pass rush production a year ago. NW also lost five of its games by 10 points or less, including a pair of overtime contests, one that went to three OTs. Basically, the Wildcats bring everything back, play in a weak division and simply have to catch better bounces this year, right? Well, that and the fact that they'll play tough games against division foes Wisconsin and Nebraska at home, plus they avoid both Ohio State and Michigan State from the East. Again, this is a flawed team, but in the West an experienced team with something to prove could be dangerous. Speaking of Nebraska, they have as much a shot as anybody to win this division, provided coach Bo Pelini can develop some depth and fill a few holes on both sides of the ball. The top end talent is there. Star running back Ameer Abdullah might just be the best back in the conference, and defensive end Randy Gregory is drawing first-round NFL Draft hype after the JUCO transfer piled up 10.5 sacks and 19 TFL last year. Quarterback Tommy Armstrong also returns for his sophomore season after showing promise, but also making some confounding mistakes in 2013. His development as a runner and passer will be critical for the Huskers' option offense to be effective. The defense should be fine, despite losing five starters, as the top five leading tacklers from a year ago return, and Gregory should be receiving more attention from opposing offenses than ever. Expect someone else to capitalize on that attention, aggressive middle linebacker Michael Rose, who will have plenty of room to roam during his sophomore campaign. Nebraska may have the most upside and top-flight talent in the division, but a lack of proven depth and inconsistencies on offense have me nervous about making them a true contender. The Hawkeyes returned to the standard their fans expect under coach Kirk Ferentz last season, going 8-5 and dropping the Capital One Bowl in tight fashion against LSU. It was a step back toward perennial contention after a head scratching 4-8 season in 2012. Iowa has always hung its hat on the offensive line, and with All-Big Ten left tackle Brandon Scherff returning for his senior season alongside junior center Austin Blythe, the Hawkeyes should have one of the best lines in the league in 2014. The running game returns its top six rushers from a season ago, including senior Mark Weisman who led the team with 975 yards on 4.3 YPC in 2013. Iowa will be able to run the ball with that line and stable of backs, but it won't be able to truly contend without returning starting quarterback Jake Ruddock taking a major step. As a sophomore last year, Ruddock ranked 9th in the conference in passing efficiency and tied for the lead in interceptions with 13. All the blame shouldn't fall on Ruddock, however, as there may not be a true play maker available in the Hawkeye receiving coprs. Kevonte Martin-Manley is the most explosive of the group, as evidenced by abilities as a kick returner, but drops and inconsistent route running held him to 388 yards on a less-than-explosive 9.7 yards per catch. If the passing game can breakthrough, the Hawkeyes should have enough talent on defense to win some games. Three of the Hawkeyes' front four return from last season, and senior safety John Lowdermilk will lead a secondary that should again have Iowa among The Big Ten's best pass defenses. Questions abound at linebacker, but Ferentz has a history of plugging them in with little problem, especially in the middle where the Hawkeyes expect big things from senior Quinton Alston. Minnesota was certainly better than you remember last year. The Gophers went 8-5 and came within a dropped pass in the end zone of their first bowl win since their 2004 upset of Alabama in the Music City Bowl. But alas, Minnesota also endured 13 straight quarters without an offensive touchdown to end the season, and there don't appear to be many game changing athletes on the offensive side of the ball. One reason for optimism, though, will be the return of running back David Cobb. The rising senior rushed for over 1,200 yards on 5 YPC in 2013, and with four starters returning in front of him, coach Jerry Kill's running game could be one of the conference's best. This team's success will be in the hands of sophomore quarterback Mitch Leidner. In his first year starting, Leidner will be asked to improve Minnesota's nearly non-existent passing game from last season. If he can do that, seven starters return from a defense that ranked near the middle of the conference in every category. The loss of tackle Ra'Shede Hageman to the NFL will hurt, but the return of pass rusher Theiren Cockran (7.5 sacks in 2013) will give the Gophers some juice up front. Ultimately, this team lacks experience at quarterback, play makers on the outside and depth on defense. The Gophers will probably overachieve and again make a bowl, but there are just too many question marks for me to see them competing, even in the weak Big Ten West. Illinois finally ended a streak of 20 straight Big Ten losses when it squeaked out a 20-16 win over lowly Purdue last November. The Illini also lose star quarterback Nathan Scheelhaase, but will get an injection of talent and experience at the position thanks to Oklahoma State transfer Wes Lunt. As a sophomore running back Josh Ferguson showed some promise. This year, Illinois hopes the now-junior can shoulder a full time load and continue to be efficient (5.5 YPC in 2013) when his carries get over 200. The speedy back is also Illinois' returning receiving leader, which isn't really a good thing, but at least they return four starting offensive lineman and should be able to run the ball. The defense will see eight starters return, but the Illini ranked 11th or 12th (out of 12) in nearly every Big Ten defensive category last year. Middle linebacker Mason Monheim returns for his junior year, and senior OLB Earnest Thomas should give the Illini at least a competent linebacking corps. The secondary is loaded with experience. Three starters return, and pass defense was actually the relative strength of the Illini D in 2013. Junior Eaton Spence is a big hitter, but also a ball-hawk with a knack for breaking up deep passes. If Illinois can improve up front around junior tackle Jihad Ward (most intimidating name ever) there is some hope for the defense to rise to the middle of the pack. After four years of perplexing in game decisions and unfulfilled potential, Purdue cut ties with coach Danny Hope and brought in one of the hot mid-major coaches of the moment, Kent State's Darrell Hazell. For all of Hope's flaws (Clock management and team discipline among them), he did get Purdue to a pair of bowl games in his last two years, so it didn't seem like a scorched-Earth rebuild for Hazell, a former Ohio State assistant under Jim Tressel. Well, a six-point win over a bad FCS team (Indiana State) and 11 losses to FBS teams later, and Purdue may have the lowest expectations in major college football. The offense was historically bad in 2013, and the defense may have been worse. The bright spots coming back will be the sophomore combination of quarterback Danny Etling and receiver DeAngelo Yancey, who each ended last season on a tear… Well, what could be considered a tear given the circumstances. The Boilermakers will certainly have speed in their backfield and among their kick returners, as Big Ten 100 Meter track champion Raheem Mostert is expecting to supplant the also speedy Akeem Hunt as the starter in the backfield, and each has shown flashes as a return man. Defensively, Purdue fans continue to wait for end Ryan Russell to live up to the hype and join the school's "Den of Defensive Ends," while a pair of freshman linebackers are perhaps the most anticipated players on that side of the ball. Gelen Robinson, son of legendary Purdue basketball player Glenn "Big Dog" Robinson, and Ja'Whaun Bentley, a physical middle linebacker from Maryland, may each start the majority of the season when all is said and done. That says something about the state of the defense when throwing a pair of freshman into the fire evokes optimism, but things can't get much worse, can they? Quick, who was the best quarterback in The Big Ten that didn't play for Ohio State or Michigan? That would be IU gun slinger Nate Sudfeld who, as a part of an oddly effective two-quarterback system in Bloomington, threw for 21 touchdowns and only nine interceptions. This season, the running element of that system (Tre Roberson) is gone, so it's Sudfeld's show to run. He has the mind and accuracy to be lethal in Kevin Wilson's spread, and the Hoosiers' bowl hopes will hinge on him being even better as the full-time starter in 2014. Well, an improved defense wouldn't hurt, but that's a little much to ask for after last year. Instead, look for Sudfeld to fun'n'gun his way to All-Conference honors, and lead Indiana back to a bowl for the first time since 2007, and only the third time since 1993. Gregory is one of those big-time talents Nebraska is really leaning on to have a big year in 2014. No doubt the athletic pass rusher has the ability, and he's already shown he can be productive throughout the rigors of a Big Ten schedule (10.5 sacks and 19 TFL in 2013). Still, Gregory disappeared for long stretches and showed weakness against the run. In the still run heavy Big Ten that doesn't equate to winning football. Coaches think added bulk that pushed Gregory up to 250 lbs. should help with that, but pad level and motor will be a big part of it as well. If he can put that all together, the Huskers could be playing in this year's Big Ten Championship Game, and Gregory could end up being a Top-5 NFL Draft pick. The Big Ten is (by far) the worst of the five power conferences. And you know what? It's not even close. The Big Ten only appears competitive because they load up on cupcakes to pad their win totals. Case in point - Michigan only finished with a winning record because they played against Akron and UConn in Weeks 3 and 4 (and frankly could have lost both of those games). Ohio State started the season 12-0, but their first four wins were against Buffalo (the 4th-best MAC team), San Diego State (the 4th-best Mountain West team), Cal (either the worst or second-worst team in the country), and Florida A&M (non-major conference). As Joe mentioned above, the Big Ten gets absolutely steam-rolled when they play the elite teams from other conferences. Since 2010, their record in New Year's Day and beyond Bowl Games (so that would include all BCS Bowls, plus other semi-prestigious Bowls like the Gator, Outback, and Capital One Bowls) is a ghastly 6-16. Every year, it seems like the SEC has three or four teams that could conceivably win the national championship (last year, they boasted 4 of the top 11 and 5 of the top 16 in the country in SRS). Conferences like the ACC, Pac-12, and Big 12 seem to have one or two teams that are legitimate national title contenders, and then two or three other pretty nice teams - the Pac-12 has Stanford and Oregon, but UCLA and Arizona State both made a lot of noise, etc, etc. The Big Ten has two teams that might sniff the four-team playoff (Ohio State and Michigan State), and then straight garbage. Wisconsin was the conference's third-best team last year, and they went 9-4, with two of those wins coming against juggernauts like UMass and Tennessee Tech. They lost to Penn State at home to close out their conference season and then South Carolina beat them by double-digits in the Capital One Bowl. And again, this was the THIRD best team in a 12-team conference. The Big Ten sells itself as an old-school football power, but they really haven't lived up to the billing over the last half-decade. And with this crop of teams, I wouldn't expect it to change.